There is a restaurant in Toronto called GUSTO 101. They have this kale salad that is absolutely amazing. It’s one of their signature dishes. 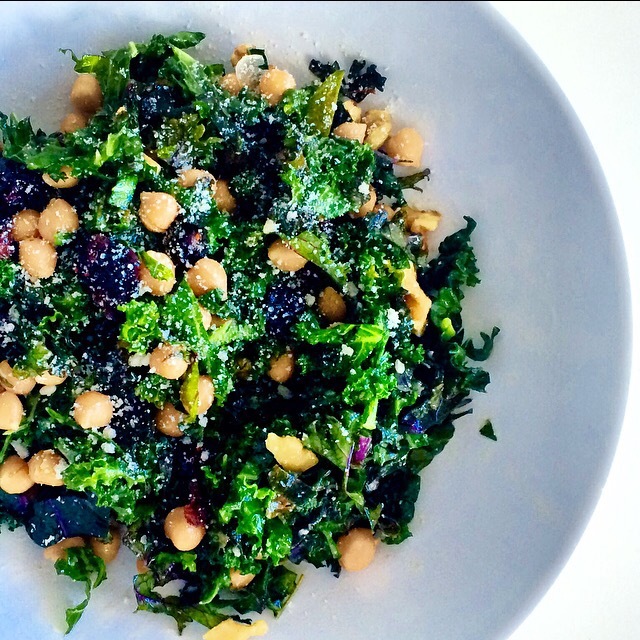 Their Cavolo Nero has kale, currants, pine nuts, pecorino, and a lemon vinaigrette. Every time I go there I order it. I wanted to make it at home and after many, many attempts I figured out the recipe. But as special and delicious and wonderful as it was, this was not an everyday salad. With the cheeses, currants, and pine nuts, this is an on occasion salad. So I tweeked it here and there, swapped out some of the ingredients and came up with my everyday version. Remove ribs from kale leaves and julienne. In a bowl, add lemon juice, olive oil, agave, salt and pepper. Mix well. Pour over kale and mix with 2 forks. Add chickpeas, walnuts, and cranberries. Mix well. Sprinkle parmesan over the salad and mix. You can sprinkle more parmesan when serving if desired. I added chickpeas to give the salad some protein and make it a meal. If you are making this as a side dish or appetizer you can leave them out. I use the PC Organics Kale Blend, it’s a blend of three kale varieties, but any kale will do, though I think Tuscan kale is the best for this recipe. This salad keeps really well. The kale is a hearty leaf and can stay dressed in the fridge for up to three days.